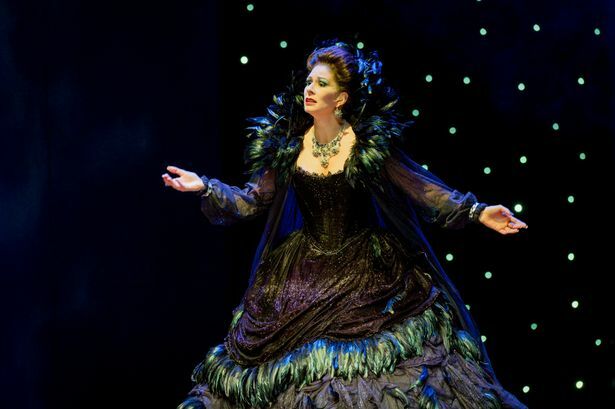 Welsh National Opera is bringing Mozart’s Magic Flute to Birmingham Hippodrome and for the Queen of the Night it will be a very special event. This spectacular character is played by Samantha Hay, once a student at Birmingham Conservatoire, and she is thrilled to be returning to the city of which she has such fond memories. “My time at the Conservatoire was very special,” she says. “The experience and performance opportunities I had as a student there were invaluable. I think it was a very nurturing place to be a student, and in actual fact I was invited back two years ago to give a talk to the vocal department with a colleague about life in the Opera Chorus. “The first opera I saw as a student was Monteverdi’s Coronation of Poppea, coincidentally by WNO, which I absolutely loved and I then went on to sing the title role at college. Sam describes the change of mindset, stepping out of the chorus in order to take centre stage as such an important soloist. “Almost eight years later and I finally decided that it was time to stop talking about going back to solo work and to actually do it! Once I made the decision to leave, contracts started coming in and the past two years have been pretty busy. I’ve been very fortunate, but I’ve also never stopped working at it. “The lifestyle takes quite a bit of adapting to, not in the least going from a salaried job to being self employed, but also there are pressures of time management and needing to be constantly on top of auditions, learning music, bookkeeping and so on. With an array of roles under her belt ranging from Monteverdi, through Handel, Mozart, Puccini, Britten and beyond, Sam finds it difficult to identify any form of specialisation, what the Germans describe as “Fach”, as she admits. “Well yes, if you look at my CV I have done a very wide range of roles. The great thing about being in the WNO Chorus is that you do get opportunities to do roles and covers and I made sure that as a chorister I auditioned for as many roles as possible in order to give myself as much experience as possible. And Queen of the Night is such an iconic role, with everyone focussed on the stratospheric Fs above the stave which this near-sorceress has to ping out with such clarity. Sam tells me how she prepares for it. “It’s a rather strange role in the sense that you are actually only on stage for around 10 minutes and there’s over an hour in between arias, but the pressure to hit those high notes is huge!” she says. “I first covered the role four years ago for WNO, and ever since it has been a role that I have tried to keep constantly in my voice. I performed Queen for English Touring Opera in 2013, so it has had plenty of practice! Samantha fills her time very interestingly when she’s not actually performing. And she concluded by returning to enthuse about the Magic Flute. Welsh National Opera perform Mozart’s Magic Flute on Thursday, March 5 and Friday, March 6 at Birmingham Hippodrome (7.15pm). Hansel and Gretel is performed on Saturday, March 7 (7.15pm). All details on 0844 338 5000.